While I have a long record of saying that drought impacts on the economy tend to be overblown, even I was surprised by the minimal drought impacts in the data released this morning. There is more data that needs to be compiled before jumping to conclusions, but I think it is important to get this information out there since the rhetoric on jobs, unemployment and water shortages is heating up again. In my view, the impacts of drought are much larger in environmental data such as plummeting fish abundance, than in jobs. I surprised a reporter earlier this week when I said that I thought the drought was a bigger environmental crisis than an economic one, and the recent data about 6 delta smelt found in the recent survey compared to virtually no change in agricultural jobs is an example. As I said, there is more data to sift through, but it is important to recognize that this drought is coming in the midst of a strong expansion period of Valley agriculture. The total number of acres irrigated and harvested has been growing every year for most of the past decade, even in the face of scarce surface water. Thus, in the absence of drought, I suspect 2014 employment would have been even higher. The drought is causing significant fallowing of relatively low value, and non-labor intensive field crops, while new acreage is coming into production by tapping groundwater. Thus, there are farmers laying people off, I don't think the farmers in news reports are lying. But clearly, there are others that were hiring. In other words, the baseline for agriculture activity is rising, as I discussed last spring in this post. The Center for Business and Policy Research opened today. Today, the Business Forecasting Center was renamed the Center for Business and Policy Research and my main office has moved to the Center's second office in Sacramento. The new name and second locations has been in the works for a while. It better describes the scope of what we do and gives us a base to build on it. 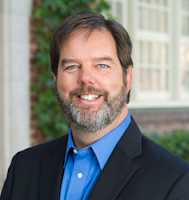 It also allows the Center to align with new academic programs that the University of the Pacific will be introducing to its Sacramento campus over the next few years in partnership with Pacific's McGeorge School of Law which was the only program on that campus until recently. See our new website here. Which California Metro Areas Are Still Below Pre-Recession Employment Levels? The latest revised payroll data shows big differences across the State's regions. 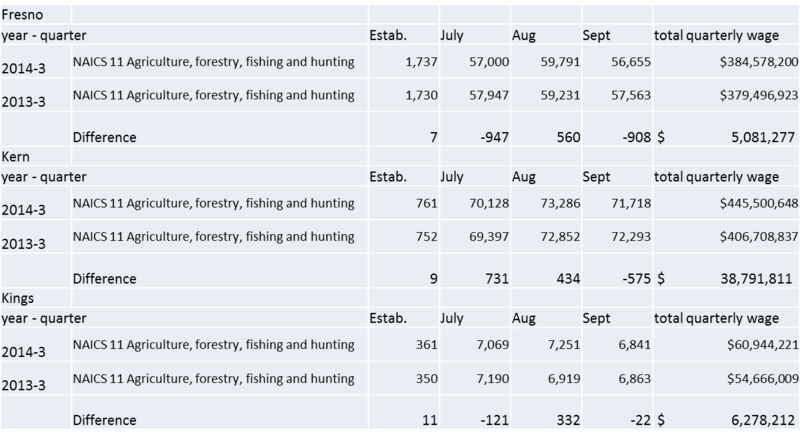 The tables below show the percentage change in payrolls (seasonally adjusted) since June 2007. Among the 10 largest metro areas in California, Sacramento is the furthest behind and soon will be the only large metro area still below pre-recession levels. The good news is that Sacramento is recovering nicely now, but the recovery started about two years late in this region. However, the biggest outlier is on the positive side not negative. Silicon Valley and San Francisco is in a league of its own. Focusing just on the Central Valley, there is a geographical pattern from north to south. The worst recovering areas are in the Sacramento Valley, while the strongest growth has been in the drought-stricken areas of the south Valley. Stockton and Sacramento metro areas are virtually tied, and both should finally cross this job recovery threshold this summer. While it has been a painfully slow process, it is actually two years sooner than we were predicting back in 2011. Army Corps of Engineers leaves Lathrop and South Stockton levees out of a draft flood control plan. The levee planning battles seem to be warming up again. The Record has an extremely interesting story about the Army Corps of Engineers draft plan for upgrading Stockton area levees. I have not had a chance to review the draft plan yet, but the article discusses an important issue surrounding RD 17. The Corps eliminated from consideration any improvements to the San Joaquin River levee that protects Reclamation District 17, a vast area stretching from Weston Ranch to Lathrop. The government’s justification is a Carter-era executive order that forbids levee improvements that might encourage development in floodplains. If the improvements went forward, the population living behind the RD 17 levee could increase by 100,000 people or more, the Corps reports. While the Federal Emergency Management Agency does not consider RD 17 to be in a high-risk flood plain, the Corps does — and that’s the problem. “We can’t responsibly invest limited funds in levee improvements in areas that would induce or facilitate growth within an area highly prone to deep flooding,” said Stacy Samuelson, a water resources planner with the Corps. The other important infrastructure is about to include a nearly $200 million VA clinic to break ground soon next to SJ General. I certainly believe in protecting floodplains, but there are other planning and public safety principals to consider as well, including the principal to concentrate development around existing infrastructure. It reminds me of Natomas in the Sacramento area. Talk about federally funded levee upgrades that will induce or facilitate development. Drexel Closes in Sacramento. What about Warwick? In recent weeks, many conversations I have had in Sacramento have turned to the University of Warwick's announcement that they are going to establish a campus in south Placer County. There are a mix of views but I would say the Warwick skeptics slightly outnumber the believers in my informal conversations. Undoubtedly, today's news that Drexel is closing its Sacramento campus bolsters the skeptical view. After all, Warwick's plan is very similar, and based on the same gift of property, as Drexel's abandoned plan. And the national higher ed headline this week is that Sweet Briar College in Virginia is closing despite a beautiful campus and a $93 million endowment adds more evidence that private, residential colleges are in financial trouble across the country and supports the view that it would be foolish to consider starting a new one. Personally, I remain very positive about the potential for higher education growth in Sacramento in spite of the well-documented challenges in the sector. I think one or more new campuses can succeed in Sacramento or Northern California, even if a hundred small private colleges close in the East and Midwest over the next decade. And I think Warwick can be very successful in south Placer County, although there is a chance they could pull out like Drexel as their phased plan has several points for them to reevaluate before significant investment is made in the physical campus. The memory of Drexel's closure is undoubtedly going to create challenges for Warwick's planned start-up phase of offering graduate programs in leased space. Potential students may be reluctant to enroll in a University that they aren't sure will still be there in 5 years, and given Drexel's history and confusion with troubled for-profits in leased office buildings around the area, those doubts will persist until Warwick can show tangible investment in the campus. Successful private universities in the Sacramento area will need to have a compelling non-monetary reason to be here, solid and patient financial backing, some visibility and connection with the Bay Area, and have the ability and desire to attract students from outside the local area. Drexel had no compelling reason to be here and sensibly closed, but I still think Warwick and others have an opportunity to succeed.